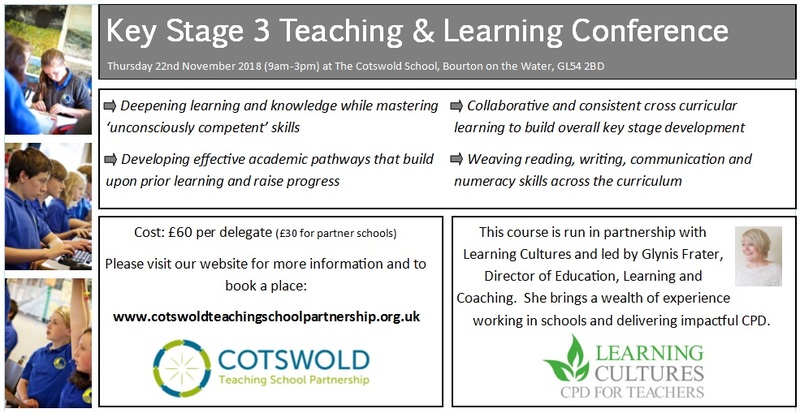 We are delighted to be working in partnership with Learning Cultures to run this exciting and timely Key Stage Three Conference. Given recent times of change in KS4 and KS2 and the concerns raised nationally about progress for 11-14 year-olds, this conference helps to revisit and develop this important key stage. There will be a focus upon developing meaningful learning, mastery and skills. Please see full agenda here. This course would suit teachers of KS3, subject leaders, senior leaders and staff interested in transition. Places cost £60 (or £30 to partner schools). Please use our booking form to reserve a place.